The theme was developed for business companies. Its flat design with bright colored blocks gives the layout a modern look. Main menu is hidden, which is great especially for mobile gadgets, which are short of space, as a rule. Slider of Business Blog WordPress Theme is placed at the center of the web page, which is rather unusual. The theme is supplied with illustrated business tips and advice section, latest news block, newsletter subscription form and Google map. It surprises the viewer with nice animated effects. Social media icons can be linked to company profiles for better promotion. The simplicity and accuracy of design conveys a message of company professionalism. Search Engine Friendly WordPress templates that are appropriate for the most common SEO plugins for WordPress. The Search Engine Friendly template is without question a suitable basic platform to begin promoting and also improving research rates of the site. It truly is more convenient to deal with this type of site for Search engine optimisation expert simply because half of the work is previously done. In case you know or hope that your target audience speaks plenty of languages (possibly they are from different locations or they may be linguists), you should have your site being built in multiple languages. WPML extension provides a multilingual switcher to the web page, enabling the visitor to your site to quickly change the web page's language. It doesn't matter if you already have got clientele talking a different foreign language, or maybe just decide to broaden your business in another country - WPML extension will help you with that. It can be works with almost all the modern day site builders and also CMS. To ensure you don't really need to worry about this. Retina Ready WordPress themes are templates that can adapt to Retina screens and still look clear and bright. With retina ready website templates your web property is going to be showcased just right even on displays with the highest definition. MotoPress Slider is a painless approach to set up eye-catching photo slides with attractive visual effects. It offers you with the ability to assemble professional-looking slides of photos, videos and text by using animation effects. It is a exceptional method when the background design moves slower in perception compared to the parts of the foreground. Therefore, Parallax leads to a sensation of a three-dimensional space. Parallax scrolling can help you bring details to your website look and feel. MotoPress Editor is known as a effective editor product for WordPress. MotoPress Content Editor may make internet site setting up procedure become something such as a game. You select the component and next simply just drag it towards the work field. It helps a newbie to produce an incredible internet site design. Bootstrap is an extremely helpful tool and that's the valid reason it's well-known. Using this framework, it will be possible to build responsive design, appropriate to any form of display size, prototype cutting edge designs without having challenges and make sure your internet site is simply cross-browser compatible. Responsive design ensures that the website page adjusts its shape and size to match any specific display screen, from the tiniest cell phones to the widest Personalized computer screens. For any gadget, web page elements get bigger or scale down to look perfect. Whatever kind of device your clients will work with to enter the web business - they're going to view a stunning picture having a effortless navigation menu. It really is an especially necessary feature, taking into account that almost all internet users at this point favor their cell phones for internet surfing. An online portfolio is a web page that allows to organize and showcase electronic documents for example graphics, articles or blog posts, website demos, etc. in a favorable way. Portfolio web-sites grow to be more and more well known for contemporary designers, photography enthusiasts and developers. Potential clients or business employers can evaluate your relevant skills from the very first visit to your online site and quickly decide if they would like to work with you. I like the image from the Business Firm WordPress theme and would like to use it for my advertising campaign, can you send me this image in a higher resolution? No, we can't provide image in higher size or resolution rather than it is on the Business Firm WordPress theme. We recommend looking for professional images on online photo resources. What is the difference between unique and non-unique WP theme for Services purchase? 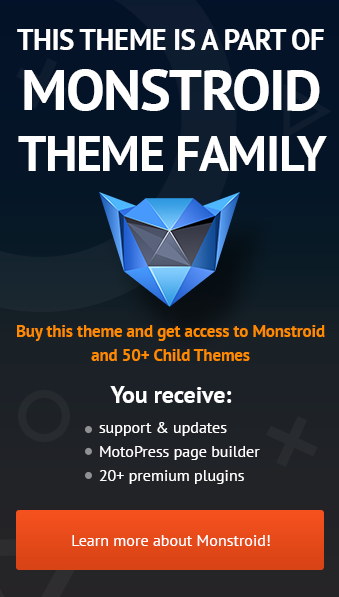 Non-unique purchase:Non-exclusive purchase means that other people can buy the WP theme for Services you have chosen some time later.Unique purchase:Exclusive purchase guarantees that you are the last person to buy this template. After an exclusive purchase occurs the template is being permanently removed from the sales directory and will never be available to other customers again. Only you and people who bought the template before you will own it. Are images included in the Business WordPress themes released under GPLv3.0 license? In the Business WordPress themes released under GNU GPL v3.0 images are not included and are used for demo purposes only. I have customized the Business WP template and would like to protect my content by copyright, can I place Copyright, Mycompanyname.com? After Business WP template purchase you can put your copyright to the template. But you cannot place a line at the bottom (or any other spot) of the customized project saying "Website design by Company name". Nevertheless, you can place "Customized by Company name". What is a buyout purchase license for WP theme for Business Blog ? If you purchase the product at a â€˜Buyout price' it guarantees that you are the last person to buy this template from us. It means that this WP theme for Business Blog may have been sold before a couple of times (see â€˜Downloads' number in item's properties) but only you and people who bought the template before you will own it. After this kind of purchase the template is being permanently removed from our sales directory and is never available to other customers again. The buyout purchase license allows you to develop the unlimited number of projects based on this template, but the template should be customized differently for every project. Can I use graphics from WP template for Business & Services I purchased for use in printing? Yes, it's not prohibited to use the WP template for Business & Services graphics for printed material, but the resolution of the templates graphics ( except for logo templates) is not enough for printing. Can I get the Business Bureau WordPress design theme in higher resolution to use for printing? No, we design WP themes for Business Blog optimized for web resolution only. Are your WordPress designs for Businessman compatible with any CMS? Can I resell Business Bureau WP templates I bought the developers license for? You cannot resell the customized WP theme for Business Firm as a template, but you may sell it as a project to your client. Will the Business Company WordPress design theme be deleted from TemplateMonster database? No, the Business Company WordPress design theme will not be deleted from TemplateMonster database. I would like to purchase WordPress design theme for Business Journal , but it is not available on the site anymore. The WordPress design theme for Business Journal has been sold out for exclusive price or discontinued.As technology inevitably develops, TemplateMonster may discontinue the production of certain products. It can be no longer available for sale because of being outdated. Can I put a line at the bottom (or any other spot) of my new product "Website development by Company name" after purchasing Business Company WordPress design theme? Yes, you can place a note at the bottom (or any other spot) of my product "Website development by Company name". Nevertheless, you cannot place "Website design by Company name"while using one of Business Company WordPress design theme. What is the price for acquiring the extended license for Business Company WordPress design theme? There is no set price for acquiring the extended license. The price is based on the Business Company WordPress design theme's unique price for those templates you would like to use for the integration. The price for purchasing license for a single template is half of the template unique price. Do you provide any scripts with your WordPress templates for Services or could you do some custom programming? Our templates do not include any additional scripts. Newsletter subscriptions, search fields, forums, image galleries (in HTML versions of Flash products) are inactive. Basic scripts can be easily added to a Corporate WP theme at www.TemplateTuning.com If you are not sure that the element you're interested in is active please contact our Support Chat for clarification. Can I integrate the WP template for Business Company with third-party software or applications for development of my new products? No, you cannot get the developers license for development of WP template for Business Company or other products. What are the advantages of purchasing a WordPress template for Business? The major advantage of purchasing a WordPress template for Business is price: You get a high quality design for just $20-$70. You don't have to hire a web designer or web design studio. Second advantage is time frame: It usually takes 5-15 days for a good designer to produce a web page of such quality. Are there any discounts if I'm buying over 10, 20, 30 or more Business Company WordPress design theme? Please email to marketing@templatemonster.com with your inquiries about Business Bureau WP templates. Will TemplateMonster help me to edit my Small Business WP theme? TemplateMonster offers you a variety of sources to help you with your Small Business WP theme. Use our comprehensive Online Help Center to get the basic knowledge about your Small Business WP theme. Our Knowledgebase contains customers questions and most frequent problems. Anyway, you can always use TemplateMonster 24/7 phone support, try our Ticket System or Live Support Chat to get qualified assistance from our support representatives. How can I modify WP theme for Business Blog to suit my particular website? Please visit our Online Help Center to obtain detailed instructions on editing WP theme for Business Blog . Is it possible that Template Monster will contact my client which website I made from Template Monster's website WordPress design theme for Business Journal ? Yes, our legal department checks licenses regularly. In case we won't find designer's contact information on the site which was made from the WordPress design theme for Business Journal of ours we will contact the owner of the site directly. What is GNU GPL v3.0 license and can I use it with WP template for Business News ? If you buy a WP template for Business News released under GNU General Public License v3.0, you can use it on any number of projects belonging to either you or your clients without any limitations. This license allows you to modify the template and its sources to suit your needs. What is Extended License for WP template for Business News ? Can I resell the WP templates for Business Magazine I bought the extended license for? No, you cannot resell the WP templates for Business Magazine as is. You can only sell them as the integral part of your new product. This is a good all round solid website. No issues with the quality of the build or the flexible design. It was easy to edit and easy to redevelop. Zakupiłem ten szablon z powodu ciekawego designu (kafelki) - dzięki takiemu układowi szablonu można podzielić stronę startową w bloki tematyczne. Tworzę na nim stronę przeznaczoną do branży medycznej, jak na razie m&oacute;j klient jest bardzo zadowolony z wyglądu strony opartej na tym szablonie. Szablon nie był skomplikowany i trudny do instalacji i konfiguracji. Z czystym sumieniem mogę polecić ten szablon oraz wsp&oacute;łpracę z TemplateMonster. I choose that template because it&#039;s different from the rest that I was looking. I&#039;m a web designer from 8 years, I&#039;m proficient with Wordpress, Joomla and Drupal. I chose that template for a my client. I liked it because was simple to insert contents, cherry framework is very good framework also for someone that don&#039;t know how manage a website. Only difficult that I had,it is find a easy tutorial to know how insert new widget position. Nice clean template. Very user friendly. Mobile friendly and responsive. Colorful. Would use again. hello! does it work on php 5.2?